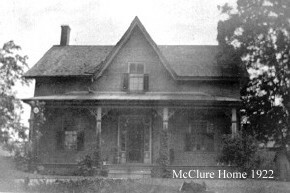 The founder was James C. Mc Clure. 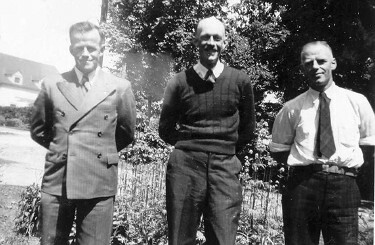 In 1947, the milk business turned to the three sons. 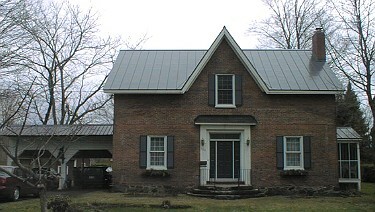 In 1918, James C. McClureand his wife, Anna Elizabeth Barron (1870-1950), purchased a farm which is today situated 308 Church Street in Cowansville. 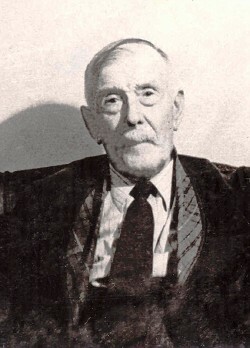 When James C. died in 1947, David, had the dairy business but the farm was owned by his brother John. The family originally came from Lachute. In 1918, Mary Alice Mc Clure maried Claude Booth Fulford. 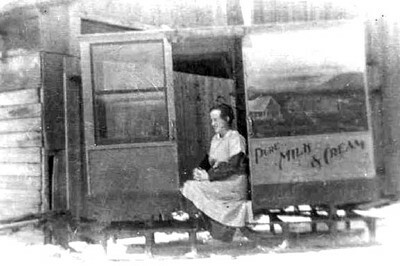 The picture of Mary Alice Mc Clure Fulford sitted in the sleigh shows that the milk business was already set up! 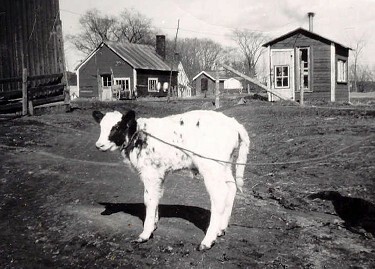 At that time, we assume that the family had a minimal number of farm animals and so would have had to build up a herd. 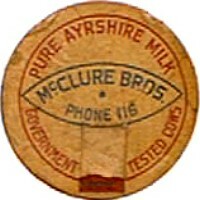 The cows were all pure Ayrshire. The Milkhouse and the Smokehouse in the back! 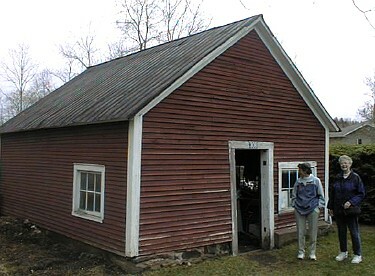 The milkhouse was situated in a small building at the end of the driveway. It is still there! There was a separator as well as sinks, water access etc... On the left side there was a very large tank that was lined with something, perhaps to preserve the wooden structure and also help preserve the cold water. As I recall, those tanks in the milkhouse were full of ice and cooling milk bottles but not long after the war they were all converted to electric refrigeration. Way earlier, there was the dreaded well just outside the kitchen door with some kind of winch and the 8 gallon milk cans were lowered into the well to keep cold. The farm was at 308 Church St. My father David, was living next door, 312 Church St. My sister Anna and I (Mary) are identical twins and we would help to wash the bottles for which we were paid 5 cents a day and ten cents on monday as we did double duty, no delivery on sunday. Joyce Jones says that she was "volunteered" to wash bottles after the empties had been picked up. "I hated that job" she said. Mary and I would sympathize with each other. Apparently Jimmy was also pressured into that job for a while and he also hated it!" At one time, my grandfather was very upset when his milk went from being grade A to grade B. It didn't take long to go back to grade A. 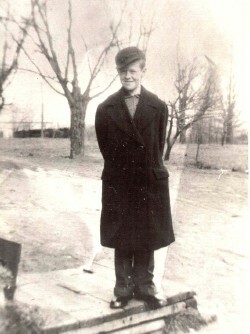 In the late 1940s, uncle Carswell, called "Mac" left and went to Maine to work for a friend. 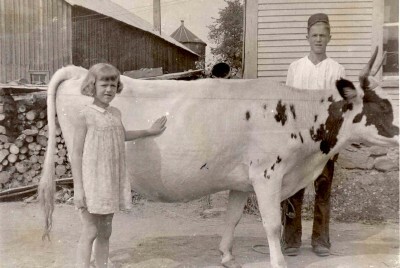 The milk business was carried on by John and his brother David, who did the deliveries and clean-up. They were doing the milking too. 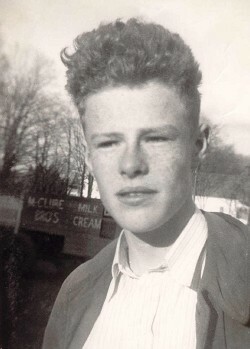 Uncle Mac came home a few years later and went back to work on the farm but in the meantime David suddenly died in November 1953. We do believe that this signaled the end of the milk business because Mac was ill and died of cancer in March 1954 and John could not carry on alone. John tried to carry on with the business but he found it too much. He died 27 February 1965. He had been retired for ten years. Joyce says that she cannot remember hearing about the business being sold but she remember about cows being sold. John did carry on by himself for a while and later he dropped the milk route and sold the milk directly to the Cowansville Dairy. He had his first heart attack and then he sold the herd basically for nothing. It was in 1955. He was really heartbroken by that. A real farmer loves his animals and my recollection was that the herd was just going to be slaughtered. The problem was that although the herd were purebred Ayrshires, he never had them registered, so they couldn't be sold as such for their true value. Did any of you guys ever go out on the route? Early it was... but kinda fun and interesting once one's brain got into gear. Of course, the horse, usually Topsy, knew the route so as long as her brain was in gear it didn't matter about the rest of us. I remember one time a guy came around and offered to paint the barn for John, absolutely free. What's the catch, said John? No catch, said the guy. Well, go right ahead, then, said John. Right... oh, by the way, there'll be a nice Molson's ad in the middle of the newly painted barn, said the guy. "OFF MY PROPERTY" said John! Thanks to the Mc Clure family!